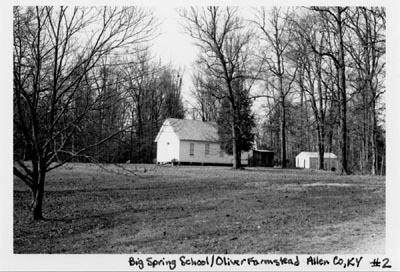 National Register of "The Big Spring School House"
The Big Spring School (AL-287) and the Oliver Farmstead (AL-286) meet National Register Criterion A and are significant within the historic context “Rural Education in Allen County, Kentucky, 1900 – 1953.” Taken together, the Big Spring School and the Oliver Farmstead illustrate the patterns and trends in rural education in Allen County from a time of local control and rapid growth in the late nineteenth and early twentieth centuries to a time of school reform and consolidation in the mid-twentieth century. 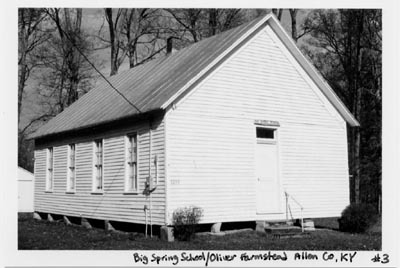 The Big Spring School typifies patterns of new school construction in the early part of this period and the dominance of the one-room school in Allen County until the mid-twentieth century. 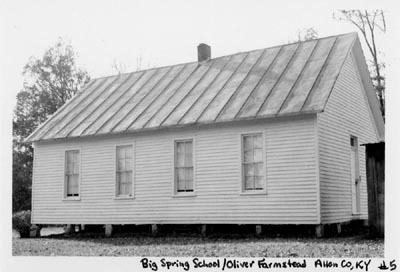 The Big Spring School is best understood in conjunction with the Oliver Farmstead. The farmstead illustrates how local landowners supported rural education by donating land for new schoolhouses, reflects the enduring Oliver family association with the school, and places the school in its economic context by illustrating the subsistence-agriculture-based economy that made the continuance of the rural one-room school a necessity far into the twentieth century. Together, the two properties contribute to a better understanding of Allen County’s rural common schools. Allen County’s 64 schools for white children placed it above the 1891 median average for number of white schools per county in the Pennyrile region of Kentucky. Considering that Allen County fell in the bottom 25% of counties for land values and taxes paid in Kentucky’s 37-county Pennyrile region, this was a considerable achievement. With property taxes paying their school teachers’ salaries, Allen County should be expected to have fewer, rather than more schools relative to the other counties in the Pennyrile. At the turn of the twentieth century, the control of Kentucky schools still remained firmly in local hands, as did the responsibility for funding the construction of new schools. Once again, the Big Spring School represents this larger situation. As Allen County deeds reflect, many individual landowners in this period deeded over their land to county school districts in order to provide for new schools. The Big Spring School was no exception; in 1889, E.C. and Elizabeth Motley deeded over a one-acre plot of their land, near the original Big Spring School, as the site for a new schoolhouse. The deed stipulated that the land would return to the family if the school district moved the school from the property. As mentioned above, a new frame building, the present Big Spring schoolhouse, was built on this land. The exact date of construction is unknown, but oral tradition places it at or near 1900. At this time in Kentucky, schools were either built with volunteer labor or were financed through local taxation. It is not known which method was used for the Big Spring School, but oral tradition holds that the Motleys donated poplar timber from their land for the construction of the school. The Motley family connection with Big Spring School continued through four generations of their descendants. At about the same time that they provided the land for the new Big Spring schoolhouse, the Motleys deeded 200 acres of adjacent farmland over to their oldest daughter, Sarah Tom, and her husband, Willie Gray Oliver. Sarah Tom and Willie Gray established their farm, and in 1892 they built a farmhouse on the land. They raised five children in this home. At least one, and probably three, of Willie Gray and Sarah Tom Oliver’s children attended the new Big Spring School. The 1900 United States census shows that Isa, Ana, and Malon Oliver, the three youngest children, attended school that year. Without a definite construction date for the new Big Spring schoolhouse, it is not clear whether the children were attending the old or the new schoolhouse at that time. A program for the December 6, 1902 closing exercises of the “Big Springs Academy” lists Ana and M. Oliver as performers, and a handwritten note includes their sister Isa as well. Assuming that the new schoolhouse was built by then, this program indicates that all three children were students there. By the 1910 census, only the youngest child, Malon, was still young enough to be listed as attending school, but by that time the new school house definitely had been built. The Oliver children achieved a higher educational level compared to other rural Allen County children. Their home’s proximity to the school was likely an important factor in providing this educational advantage. The 1900 United States census shows that three out of five of the Oliver children had each attended five months of school in the past year. While the census data for 1900 has not been analyzed in this way, statistical analysis has shown that in 1920 only 19.5% of Allen County’s children between the ages of 7 and 20 attended school. The Oliver’s 60% attendance rate was significantly higher. Furthermore, at 18 and 20, it is not surprising that the two older Oliver children no longer attended school, especially since Cecil, the oldest, was married. The census shows that by 1910 all five of the Oliver children had learned to read and write. The children’s 0% illiteracy rate compares favorably with the 22% illiteracy rate among Allen County’s native white population in that year. 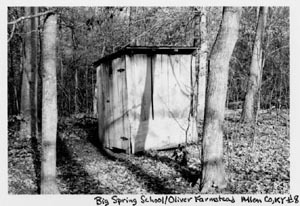 The Oliver family’s association with Big Spring School continued into the third and fourth generations. When Willie Gray Oliver died in 1925, the youngest son Malon brought his family to live at the farmhouse, joining his widowed mother Sarah Tom Oliver. Malon’s daughters Stella and Zola attended the Big Spring School in the 1920s and early 1930s. Malon’s family remained in the farmhouse until Sarah Tom’s death in 1938. When Sarah Tom Oliver died in 1938, her oldest son Cecil inherited the farmhouse. He moved in along with two of his grown children, who had previously attended Big Spring School. County school censuses reflect that both Cecil and Malon served as enumerators for the Big Spring School census in the 1920s and 1930s. When the Big Spring School finally closed its doors in 1956, the land reverted to Walter Conner and his wife Lula, a granddaughter of the original Olivers and a former Big Spring School student. Although the Conners regained title to the school’s land, they had to purchase the schoolhouse from the county in 1958. 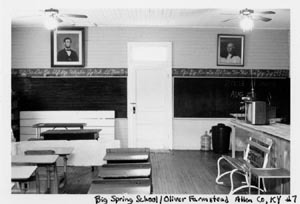 The current owners of the schoolhouse, great-grandchildren of the original Olivers, attended Big Spring School in the 1930s and ‘40s. In addition to illustrating the donation of private land to school districts, the Oliver farmstead also tells the story of the relationship between Allen County’s economics and its rural educational system. Allen County was a predominately rural county, with 81.5% of its homes located on farms in 1910. Likewise, the majority of Allen County schools were located in the countryside and were surrounded by farms. According to The Pennyrile Cultural Landscape, Allen County falls into a sub-region characterized by soils with medium to low fertility, with mostly small subsistence farms, and devoted more to livestock than to the cultivation of tobacco. While wealthier regions of Kentucky began modernizing and consolidating their rural schools in the 1920s and ‘30s, Allen County was not able to afford to consolidate and modernize the majority of its schools that early. While small improvements were made, the one-room rural school continued to dominate the county’s educational system until the 1940s and ‘50s. Other subsistence farming areas of Kentucky followed the same pattern. In the early 1950s, Kentucky still retained 3,000 of the 5,000 one-teacher schools found in the commonwealth in 1936. Retired Teachers of Allen County, School Days of Allen County, Kentucky: From Ciphering and Reciting to the Age of Technology. (Allen County, Kentucky: privately printed, 1992), 17. Quoted in Edwina Ann Doyle, Ruby Layson, and Anne Armstrong, eds, From the Fort to the Future: Educating the Children of Kentucky. (Kentucky Images: Lexington, Kentucky, 1987), 108. Rachel Kennedy and Cynthia Johnson, Kentucky Historic Schools Survey: An Examination of the History and Condition of Kentucky’s Older School Buildings. (Frankfort, Kentucky: Kentucky Education, Arts, and Humanities Cabinet, 2002), 34-35. Retired Teachers, School Days of Allen County, viii. Doyle, Layson, and Armstrong, From the Fort, 112. Quoted in Retired Teachers, School Days of Allen County, viii. Charles E. Martin, The Pennyrile Cultural Landscape. (United States Department of the Interior, National Park Service and Kentucky Heritage Council, 1988), 468. Allen County, Kentucky, Deed book 4, p.6; Retired Teachers, School Days of Allen County, Kentucky, 17. Wilmer Dean Oliver, telephone interview by author, 18 November, 2002, notes in author’s possession. C.W. Hackensmith, “Out of Time and Tide: the Evolution of Education in Kentucky,” Bulletin of the Bureau of School Service XLIII, no. 2 (Dec 1970): 89. Dal Clark, interview by author, 8 September, 2002, vicinity of Settle, Kentucky, notes in author’s possession. U.S. Department of Commerce and Labor, Bureau of the Census, Twelfth Census of the United States: 1900, Population Schedule, Commonwealth of Kentucky, Allen County, Supervisor’s District 3, Enumeration District 5, Sheet 3. Printed in Retired Teachers, School Days of Allen County, 179. U.S. Department of Commerce and Labor, Bureau of the Census, Thirteenth Census of the United States: 1910, Population Schedule, Commonwealth of Kentucky, Allen County, Supervisor’s District 3, Enumeration District 6, Sheet 10A. of the United States: 1900. Martin, The Pennyrile Cultural Landscape, 520.
of the United States: 1900; Thirteenth Census of the United States: 1910. Martin, The Pennyrile Cultural Landscape, 495-496. Wilmer Dean Oliver, electronic mail messages to author, 31 May and 2 June, 2003; U.S. Department of Commerce and Labor, Bureau of the Census, Fifteenth Census of the United States: 1930 Population Schedule, Commonwealth of Kentucky, Allen County, Supervisor’s District 11, Enumeration District 2-7, Sheet 4A. Allen County, Kentucky, County School Census, Subdistrict 12, 1924; Allen County, Kentucky, Enumerating Sheet for Recording School Census Data, Subdistrict 12, 1934. Noble Allen, Superintendent of Allen County Schools, open letter, 13 September, 1958. Martin, The Pennyrile Cultural Landscape, 492. Martin, The Pennyrile Cultural Landscape, 4, 6. Kennedy and Johnson, Kentucky Historic Schools Survey, 28.